Assembly of a right MC-21 wing panel has been completed at Kazan-based AeroComposit company (a part of the United Aircraft Corporation). The wing panel is delivered to Irkutsk Aviation Plant, developer of the aircraft Irkut Corporation reported. 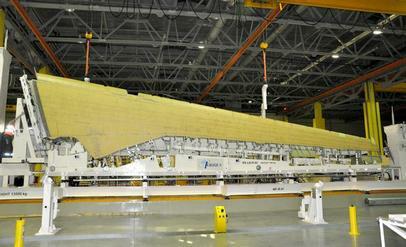 Assembly of the left wing panel of MC-21 is nearing completion. The MC-21’s wing is made of polymeric composite material and is 5-10% lighter than a similar structure made of aluminum alloys, says Irkut. Vacuum infusion technology has enabled Irkut’s engineers to design the integral primary structure avoiding excessive use of fasteners. The MC-21 wing consists of over a hundred large elements. In August 2015, Irkut announced it was expecting to receive the wing for the first MC-21 prototype in the coming autumn. The fuselage was assembled and ready for wing attachment by December. Currently, aircraft systems are being installed on the fuselage. Toward the end of 2015, Denis Manturov, Russia’s Minister for Industry and Trade, told the media that due to delays in the program the first Mc-21 prototype will not be rolled out until the middle of 2016, followed by the maiden flight later in the year. The initial plans called for these program milestones to occur at least six months earlier. The OEM does not explain the reason for the delay. At the same time, work on the second MC-21-300 prototype continues: in mid-January Ulyanovsk-based Aviastar-SP announced that it would deliver five fuselage sections to Irkutsk. The empennage and doors are on track for delivery. The manufacturer has also started work on the tail cone and APU sections for the third aircraft. Certification of the 160-211-seat MC-21-300 version is slated for 2017 or 2018.